The notion that Europe might go into the match starting on 28 September without last year's Masters champion would have been unthinkable before a wretched summer for the Spaniard. Missing all four cuts in this year's majors and no top-10 finishes since June's French Open put Garcia's participation in serious jeopardy. He was reliant on one of Bjorn's four wildcards and is fortunate to receive one. 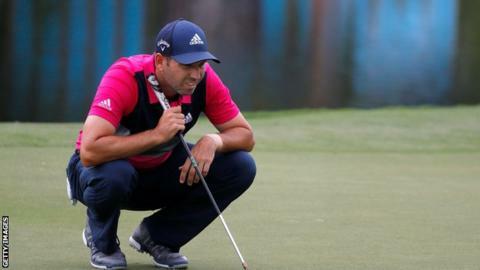 Inevitably Garcia - named as one of four wildcards along with Paul Casey, Ian Poulter and Henrik Stenson - will head to Le Golf National carrying a lot of pressure on his experienced shoulders. This will be his ninth Ryder Cup, having missed only one of these biennial contests (in 2010) since his debut in 1999. Rapidly he needs to rediscover the form that has made him one of the world's best players for a generation. The Ryder Cup might just provide the inspiration but the unique pressures of the contest are just as likely to inhibit. As Bjorn has admitted in the past, the Ryder Cup is no place for golfers short of confidence. So the coming days will be vital for Garcia to find reason for positivity in his golf. If he does, this will be seen as an inspired selection. Garcia is one of the great Ryder Cup partners having lost only six of 23 foursomes and fourball matches to date. He is particularly adept in the alternate shot format with nine wins, three halves and only three defeats. With five rookies in the team the Spanish star has a vital avuncular role to play but it is entirely dependent on form. Two years ago Lee Westwood was earmarked for that role and lost all three of his matches; it was a Ryder Cup too far for the Englishman. Who qualified automatically for Europe's Ryder Cup team? Bjorn might have chosen Rafael Cabrera Bello, who would have earned sufficient world ranking points to qualify had the latest PGA Tour play-off event not finished a day after the deadline. The Spaniard is very unlucky, especially given his stellar debut at Hazeltine where he won two-and-half points out of three. Given the relative inexperience of the eight qualifiers - only Rory McIlroy, Justin Rose and Francesco Molinari have felt the white heat of the Ryder Cup - it was inevitable Bjorn would lean towards experience. This put paid to Matt Wallace's chances despite his heroics in claiming his third win of the year at the Made in Denmark tournament last Sunday. The Englishman has all the qualities to be a star in these matches going forward but this match has come too soon. As I noted earlier in the week, Wallace shares similar attributes to Poulter, who brings a unique spark to the European team room. Re-established as one of world's leading players Bjorn, who calls him "the man for the occasion", is right to invest in Poulter, someone who has won 13 out of 18 Ryder Cup points to date. Casey was also a banker. Bjorn described the pick as "a no-brainer" and is a big fan. Having courted the Englishman to return to the European Tour at the start of the year the captain could not ignore him after a season of steady returns at the very highest level. Casey is a world-class player and will be chomping at the bit having missed every Ryder Cup since 2008. Controversially overlooked by Colin Montgomerie in 2010, he is a golfer who has ridden a string of peaks and troughs. The Arizona-based Briton has the stature to look his American counterparts in the eye and will relish the chance of taking on Dustin Johnson, Brooks Koepka and co.
A similar case can be made for Stenson, the Swede who has overcome a recent elbow injury that undermined much of his golfing summer. This will be his fifth Ryder Cup and he will be keen to continue his productive partnership with Justin Rose that was so vital the last time Europe played at home at Gleneagles in 2014. Stenson's coach Pete Cowen says that his pupil's ball-striking is back to his best. His metronomic three-wood could prove a key weapon in France; however there are concerns on the greens that need to be ironed out in tandem with putting coach Phil Kenyon. Europe will take a strong side into this Ryder Cup but the United States are deserved favourites. For the continent to wrestle back the trophy these wildcards will be under pressure to repay the faith shown by their captain.